← Introducing Books from The Great Escape. Our “Escape” writing contest for micro fiction and poetry received a record 29 entries from 24 different writers. We’d like to extend a huge thank you to everyone who took part and helped make this the best and most exciting contest we have run so far. So we now declare Team Micro Fiction the winner of this battle of the short form literature! In recognition of this, the winners from the micro fiction category will be presented first. 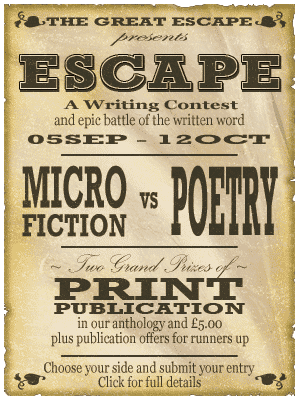 You can read the winning entries in this week’s fiction post: Micro Fiction Vol 2 : Escape. The winners from the poetry category are also now available to read in the new fiction post Three Poems of Escape. Congratulations, Teagan, your £5 prize will be on its way to you soon. Congratulations, Rich, your £5 prize will be on its way to you soon. Both winners and all the runners up will be offered the chance to appear in Great Escapes | Volume 2 (scheduled for Autumn 2013). For more information about Great Escapes | Volume 1, scheduled for release January 2013, check out our books section.